At a recent project, there was a requirement to describe the CSS used on a site, as a documentation, other developers could use. We decided to go a bit further — not only documenting the CSS classes — but making a guide that developers could find easy to use. Also we wanted developers with little or no CSS knowledge to be able to use the guide. The usual design guide that dictates colors for headings, which images to use for bullet lists, margins between elements, line-heights, etc. When it comes to implementing the actual markup, the usual design guide is no help for developers when the first page is up on the website. Developers can focus on business logic. No knowledge of CSS required for web developers. Experts took care of CSS, browser bugs, aligning pixels, etc. Testing can be less thorough on other browsers once the initial work is done. *) over time as a common format emerge on several portals. It is my hope that we can use examples like this to make development of public applications cheaper and more consistent. Virk.dk is the Danish public portal for everything companies need to interact with public authorities. Technical note: Still has minor browser rendering issues that we are looking into. HTML is as clean as the graphical design allows. TDC, the big Danish telco has a similar guide, also public available. Technical note: Suffers from tag soup, but otherwise is very comprehensive. 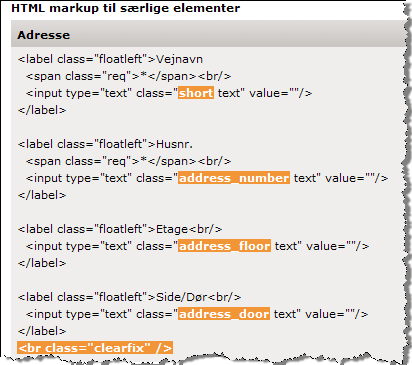 This entry was posted by Jesper Rønn-Jensen	on Friday, February 8th, 2008 at 13:47 (GMT-1)	and is filed under Web Development, Web Standards. You can follow any responses to this entry through the RSS 2.0 feed. Both comments and pings are currently closed. Amazing article, shame the guides aren’t in english! Is there a difference between these guides and a comprehensive design document? I might be confused because I use the phrase “web developer” to refer to people involved in all parts of the process of creating a web presence (that is, the person who designs the visual look, the person who writes HTML and CSS, the people who write client-side and server-side code, etc), and I’m realizing that you might be using it in a more specific way. Jesper, is there any way we can get this guide in English? Nice post and it would be great if the guides ware in English. I would be interested in seeing the web design guide in english also. I am sure alot of people would like to be able to read it over. I’ve got a friend at work who is Danish ;) I’ll have to get him to translate. Brian, thanks a lot for pointing out the new location of the Virk HTML guide. I have now updated the links.